Too many fabulous perennials, too precious few square feet in which to grow them. Not that Toad Lilies are an acquired taste. It’s just they typically are not found featured for sale at your average perennial nursery, unless it’s exceedingly large or caters to a more refined clientele. 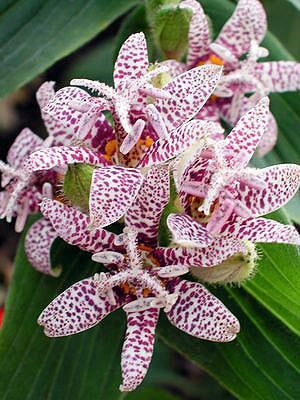 Toad Lilies are uncommon jewels among perennials, with a large number of cultivars featuring textured and sometimes variagated foliage and typically small (1”) but dazzlingly colorful flowers with exotic, tropical form bursting forth in uniform sprays. A great advantage is that Toad Lilies bloom in late summer and fall, when fresh bloom is most needed. Most grow well in USDA Zones 4-9, though the cultivar count expands for you cheaters in the relatively balmy realm of Zone 6 and warmer. For northern gardeners, they are perhaps the most tropical-looking hardy perennial that can be grown. 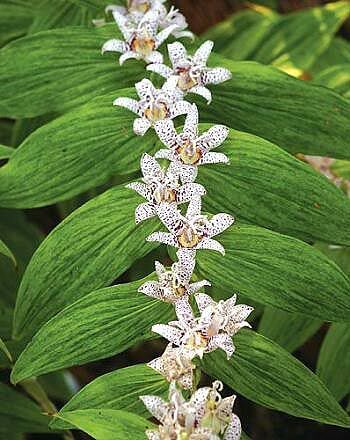 Toad lilies thrive in shade, from full to partial, depending on variety. Most varieties do very well in true dappled shade. Soil should be acidic, amended with ample organic matter and not allowed to dry out. Research varieties online to become familiar with height of each, as it can vary from 12 to 40 inches. 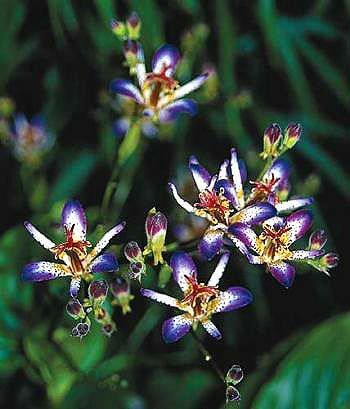 Plants are relatively slow growing but do eventually clump up and expand their girth, so a single toad lily here and there will eventually command attention. I find it much easier to plant them in threes or fives of the same variety either in a clump or swath. They combine magnificently with ferns and broad-leaved shade perennials such as hosta and polemonium (lungwort).